Definition. Circle is a set of all points in the plane which are equidistant from a given point О, called the center of circle. Definition. Unit circle is a circle, whose radius is equal to one. Definition. Disk is part of the plane bounded by circle. Definition. Radius of circle R is the distance from the circle center О to any point on the circle. Definition. 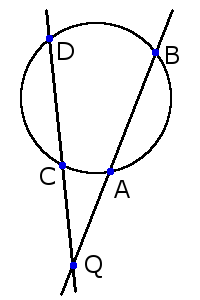 Diameter of circle D is a segment that connects two points on circle and passes through its center. 1. Diameter of circle is equal two radiuses. 2. The shortest distance from the center circle to the secant (chord) is always smaller radius. 3. Three points that not placed on a straight line can hold only one circle. 4. 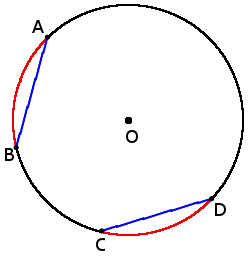 Among all closed curves of equal length, circle has the largest area. 5. If two circle touch at one point, this point placed on the line that passes through the centers of the circles. Definition. 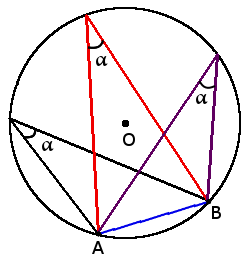 Tangent is a coplanar straight line that touches the circle at a single point. 1. 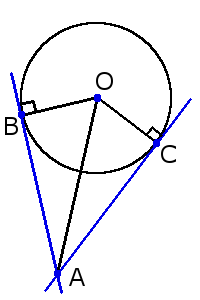 Tangent is always perpendicular to the radius of the circle drawn at the point of contact. 2. The shortest distance from the center of circle to tangent is radius of the circle. Definition. 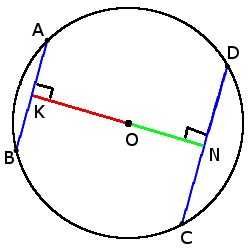 Secant of a circle is a straight line, connecting two points of circle. Definition. 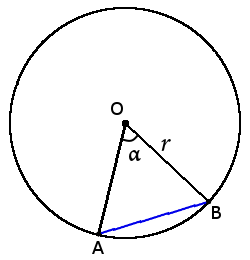 Chord of a circle is a segment that connects two points of circle. 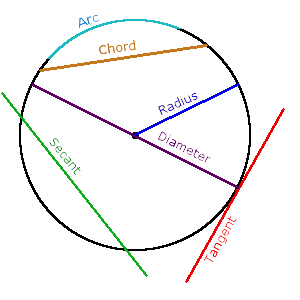 Chord is a segment of tangent. 5. 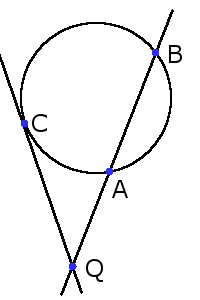 Chords of equal length are equidistant from the center of circle. 6. The greater chord the closer it is to the center. Definition. 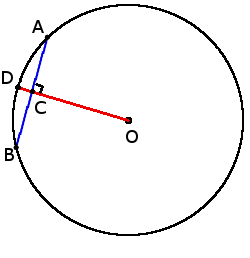 Central angle circle is the angle, the apex of which is the center of circle. Definition. 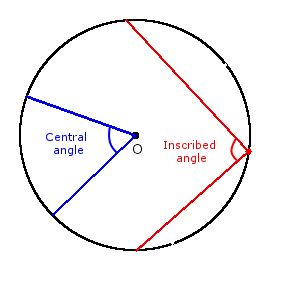 Inscribed angle is the angle inside the circle, the apex of which lies on the circle. 1. 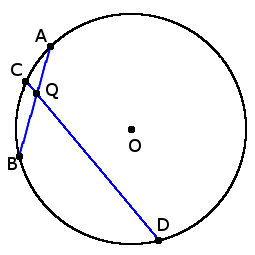 All inscribed angles, based on one arc is equal (one end of the chord). 2. 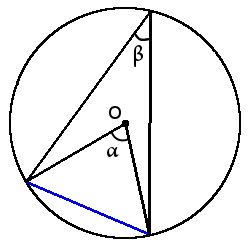 Inscribed angle will be a straight (90°), if it is based on the diameter of the circle. 4. 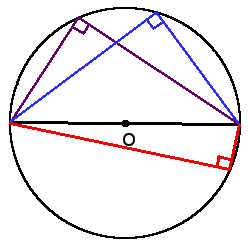 If two inscribed angles based on a chord and located on either side of her, the sum of the angles is 180°. Definition. 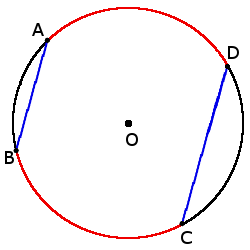 Arc of a circle (◡) is part of the circle, connecting two points on the circle. Definition. 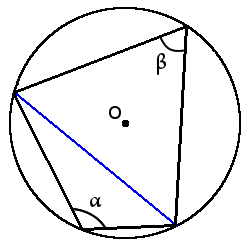 Subtending angle of an arc is angle between two radii which limit this arc. 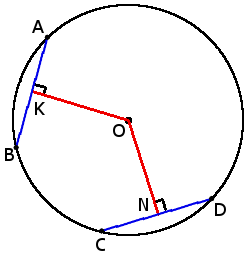 Subtending angle arc is always equal the central angle between radii, which limits end points this arc. Definition. 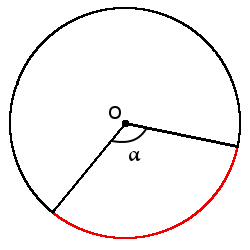 Semicircle is arc whose ends are connected by diameter of a circle. Definition. Semidisc (◓) is part of the disk, which is bounded by a semicircle and diameter. Definition. 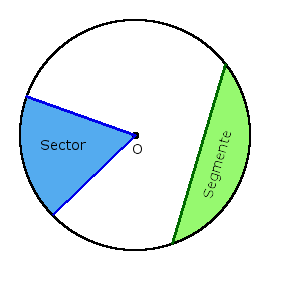 Sector (◔) is part of the disk, which is bounded by two radii and an arc between the radii. Definition. Segment is part of the disk, which is bounded by the arc and the chord connecting the ends of this arc. Definition. Concentric circle is circle with different radii whish having a common center. Definition. 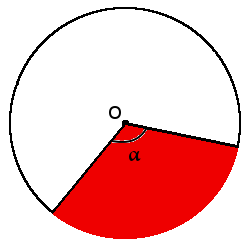 Annulus is part of the plane bounded by two concentric circles.